It's not often that one has the opportunity to meet a living legend. That chance came my ay in mid-July, 1989, when Angela Davis visited Philadelphia to give the Women of Color Keynote address at the Eleventh Annual Conference of the National Coalition Against Sexual Assault, held at the Wyndham Franklin Plaza Hotel in Center City. Angela Davis was the first "great cause" that I became associated with (in a minor way, to be sure) when I joined the Women's Movement in the early 1970s. As a matter of fact, I still have my "FREE ANGELA DAVIS" button that I wore in much the same manner and spirit that I had worn by anti-Vietnam War button and my "FREE JOAN LITTLE" button some years later. At that time, I knew very little of Angela Davis' background. I simply knew she was a Black Sister held captive in whitey's penal system, and, knowing this country as well as I did, I knew that not only were they going to give her a hard row to hoe, but I would have been willing to bet my life that once again America had gone out of its way to entrap an innocent Black person in its ancient trick bag. In his book Angela Davis, [Lancer Books, 1973, pp. 19-20], writer Marc Olden put it this way: "In reading about militant blacks who taught in universities, bought guns, and ...admitted they were communists, white America reacted predictably. A gun-toting red was Lucifer come up from below...the black view was different. All of those opposing her were white. It was the white world that tried to stop her from teaching, that had threatened her life...and...was now charging her with murder and kidnapping. Angela Davis was a black woman fighting back. Angela Davis was a sister in trouble." To be sure, there were many white brothers and sisters who joined the movement to Free Angela Davis that eventually spread around the world, but Marc Olden was correct, the Black support for Angela Davis was well-nigh unanimous, because, as Aretha Franklin said when she offered to put bail up for Davis, she wanted to do so, "...not because I believed in Communism but because she is a black woman and ...wants freedom for black people." As Marc Olden pointed out, more than anything else perhaps, Angela Davis's almost leap into celebrityhood back in the early '70s was largely due to the white establishment's reaction to her. "....in opposing her so consisterly, they succeeded in united blacks behind her...the white world built its own monster in Angela Davis, then ran from her in terror. 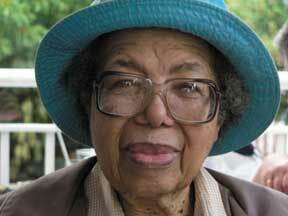 And the more frightened whites were of her, the more her stature increased in the black community." Reading about Angela Davis in later years, I was stunned to learn how, in so many instances, her early life history recalled my own history. True, we are a generation apart. When Davis was born in Birmingham, Alabama, in 1944, I was beginning my first year at Temple University. But, some, twenty years prior to that, I had first opened my eyes upon a chilly world in South Carolina, in a town much smaller than Birminham, in a family much less affluent than Davis's, but since our skin coloring is the same, we both grew up in a world that never seemed to tire of finding ways to make life as miserable as possible for all people of color. When I learned that Angela Davis had left Birmingham at age fifteen to live in Brooklyn, NY, in order to attend a private, nearly all-white high school in Greenwich Village, I could emphathize with her, because at fifteen, I, too, had fled to the North and found myself attending a nearly all-white school in the suburbs of Philadelphia. Years after her graduation from the Elisabeth Irwin High School, Davis was quoted as saying "she felt her blackness more than she ever had in the South--not in the customary-racist ways, but because people made such effusive overtures to her and because of their awkward attempts to ignore that she was black." [from Who is Angela Davis? The Biography of a Revolutionary, Regina Nadelson, (New York: Peter H. Wyden, 1972), p. 65]. 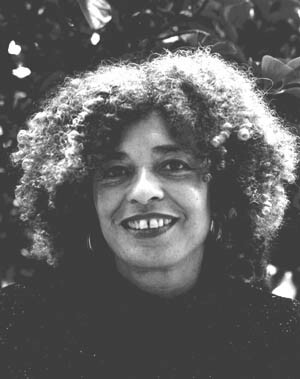 One could really argue that not only did the educational institutions that Angela Davis attended, or was otherwise associated with--Elisabeth Irwin, Brandeis, the Sorbonne, Goethe University in Frankfurt, UCSC--play such a pivotal role in her life that they laid the groundwork for her eventually becoming a revolutionary, but one institution, UCLA, was directly responsible for catapulting her into the legend of near mythical proportions that she is today. Oddly enough, 1989 marks the 20th anniversary of Davis's dismissal from the University of California at Los Angeles where she had hoped to settle down and teach philophosphy while working on her Ph.D. with her mentor and former teacher from Brandeis, philosopher, Herbert Marcuse, then stationed at the University of California at San Diego. The firing of Angela Davis in September, 1969, because she was an admitted member of the Communist party, soon took on a circus quality as zealots from the Right sought to discredit her in whatever manner they could, while those from the Left clamored for her academic freedom. In October, 1969, Davis was re-instated by order of the Court only to be dismissed again in June, 1970. by that time, she had become a bona-fide celebrity. Later, on August 7, 1970, shots that would eventually resound around the world were fired when a brother of one of the famous Soledad Brothers--Jonathan Jackson--walked into a courtroom in San Rafael, California, armed three prisoners from San Quentin in the courtroom, took several hostges--including the judge--and tried to escape in a van parked outside. When the scenario had run its course, the judge, Jonathan Jackson, and two of the three prisoners were fatally wounded. The remaining prisoner, Ruchell Magee, was charged with kidnapping, murder and conspiracy. And since Angela Davis had been speaking on behalf ofthe imprisoned Soledad brothers, and since the guns that Jonathan Jackson had smuggled into the courtroom were allegedly bought by Davis, she, too, was charged with kidnapping, murder and conspiracy. Thus was the stage set for the birth of a legend.